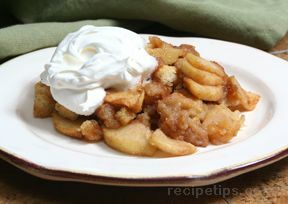 Most often several apple preparation tasks are required when using apples in recipes. 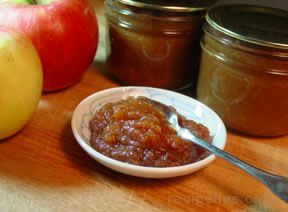 Some of the commonly used apple preparations are peeling, coring, cutting, and slicing. 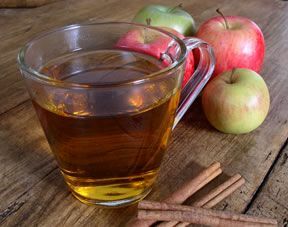 It is also necessary to prevent the apples from turning brown for some recipes. 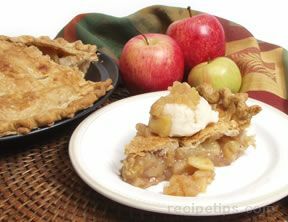 When making Baked Apples you may only need to core the apples, but if you are making Apple Pie or Apple Crisp you will need to peel, core, and slice the apples. 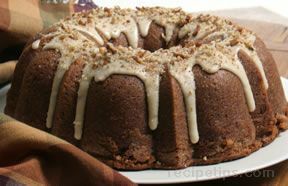 For Apple Bread or a salad with apples you may have to also dice the apples. This apple preparation guide will show you how to do these tasks easily and efficiently. 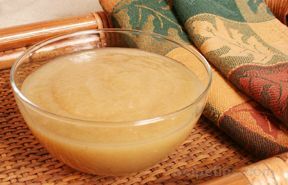 Some of the preparation of apples can be accomplished by using several different techniques. You can choose the technique that works best for you. 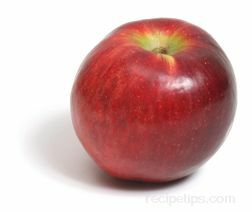 Most apples can be eaten out of hand just as they are or they can be cored, peeled and sliced first. 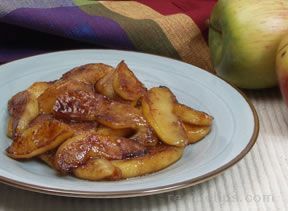 Generally, if they are going to be cooked or used in other food dishes, the apples must be prepared in some manner. 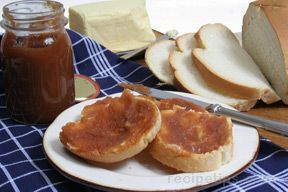 Some of the tools that are used and the common preparation methods called for in apple recipes are shown below. A tool used to trim the outer skin of an apple from the apple flesh. This device will most often remove the core while removing the skin around the apple, leaving it cored and either whole or sliced. 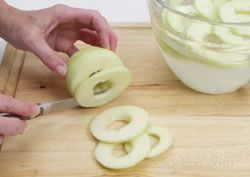 A kitchen utensil that is used to cut whole apples into individual sliced wedges, while also cutting around the core so that the seeds and core can be easily discarded. This tool is generally made of aluminum or stainless steel with sharp blades that are formed to slide smoothly through the flesh of the fruit. 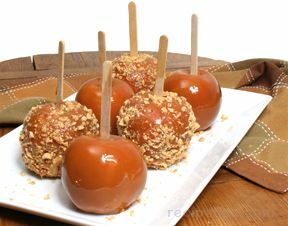 Apples can be cored using several methods. 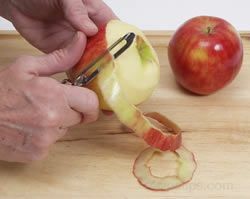 As shown above, an apple corer can be inserted down through the middle and pulled back out to remove the core. 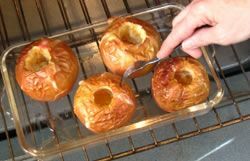 When making baked apples stuffed with other ingredients, the blossom end of the apple should be left intact with approximately 1/2 inch remaining. 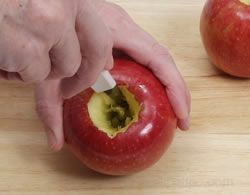 If the apples need to be peeled, they can be peeled before or after the core is removed. 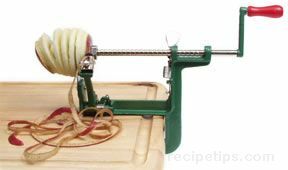 A problem that can occur when using the apple corer is that all the seeds may not get removed because the diameter of the corer is not wide enough. The remaining seeds can be removed by using a paring knife to scrape them out. 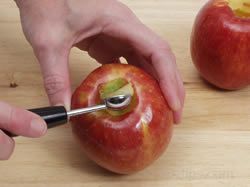 If you do not have an apple corer to remove the core, you can remove it by using one of the methods shown below. 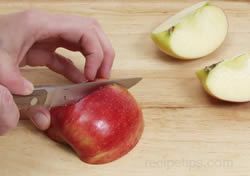 Using a sharp paring knife, insert it in the apple along side the core and cut around the entire core. 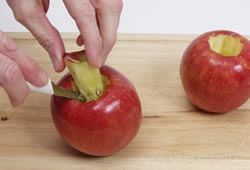 After cutting around the core, remove it by pulling it from the center of the apple. It may be helpful to use the paring knife to assist in prying the core out until it is out far enough to get a firm grip with your fingers. 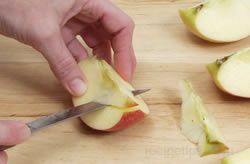 If some seeds remain in the apple, use the knife to cut more out of the center until all seeds are removed. A melon baller can also be used to remove the core from an apple. Begin scooping the core out from the stem end of the apple. 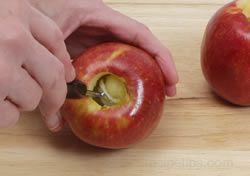 Continue to remove the core from the cavity of the apple by inserting the melon baller and using a twisting motion to scoop the core from the center of the apple. 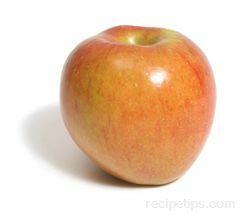 If the apple is going to be stuffed, be sure to leave approximately 1/2 inch at the blossom end of the core. 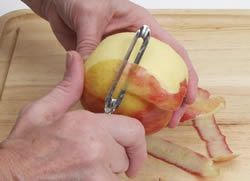 If it isn't required that the apple remain whole, the following method can be used to remove the core. 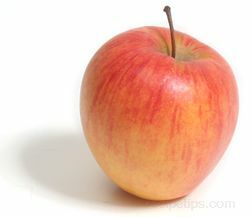 The apple can be peeled or left unpeeled. 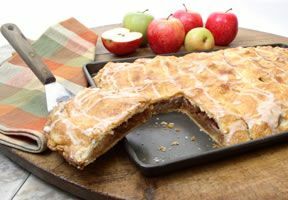 Cut the apple in half lengthwise from stem to blossom end. Cut in half again to form quarters. 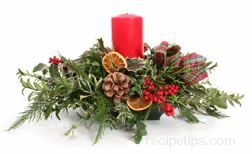 Using a sharp knife, cut at an angle starting at one end and cut to the middle of the section. Starting at the opposite end cut to the middle, meeting the first cut. Remove the core from the quarter section. Using the same method, remove the core from the remaining sections. 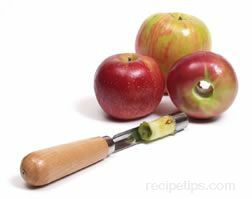 Apples can be peeled by using an apple peeler, which is a tool used to trim the outer skin off apples. This device will most often remove the core while removing the skin around the apple, leaving it cored and either whole or sliced. 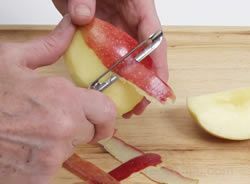 If you are peeling a lot of apples, this device can save you a lot of time. 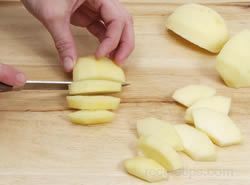 If you do not have an apple peeler or do not have a need for peeling a large quantity of apples, you can peel the apples by hand using one of the methods below. 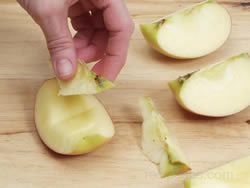 Using a vegetable peeler or a sharp knife, peel a thin layer of skin by cutting strips around the apple. Start at the stem end and work down towards the blossom end. 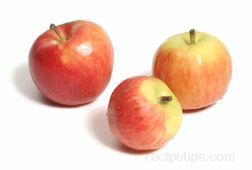 Apples can also be peeled by cutting thin vertical layers, starting at the stem end and peeling down to the blossom end. 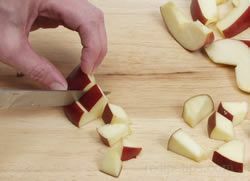 Continue to peel vertical strips by overlapping the previous cut until the all the skin has been removed from the surface of the apple. The apple can also be peeled after it has been cut into quarters. 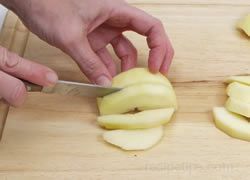 Cut apples into quarters and remove core as shown above. 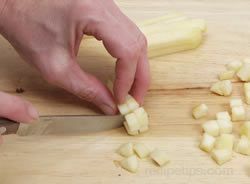 Using a sharp knife or vegetable peeler, peel thin vertical strips from each of the quartered sections. 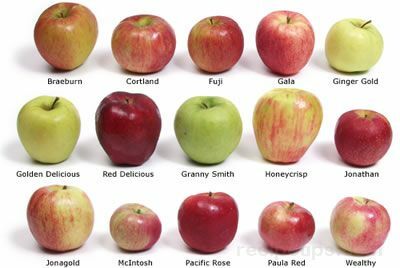 Apples can be cut in many shapes and sizes, such as rings, slices, wedges, and triangles. 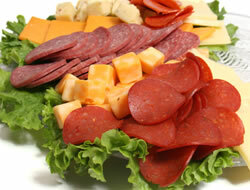 They can also be diced, julienned and shredded. 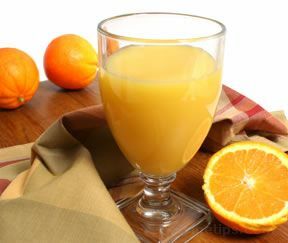 Generally the end use of the apple will determine how it is to be cut. 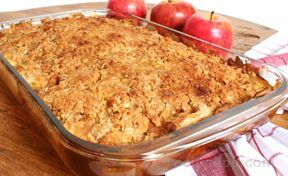 The larger cut pieces are often used in apple recipes where the apple will be cooked in some manner, such as apple crisp. 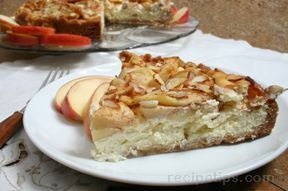 Generally recipes where the apple will not be cooked, such as in salads, they will be cut into smaller pieces. 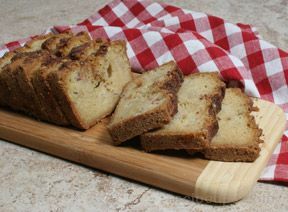 When used in baked goods such as Apple Bread, Apple Cake, or Apple Muffins, the apples are most often diced. 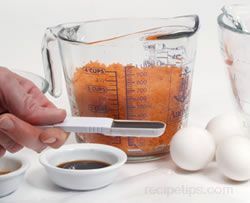 Refer to the recipe for suggested cutting instructions. 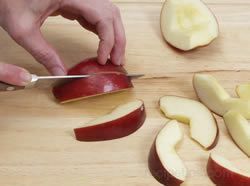 Shown below are some common options for cutting apples. Remove the core and seeds from the apple. 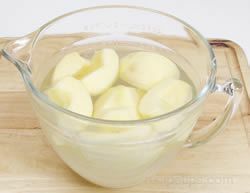 If desired or called for in the recipe, peel the skin from the apple. 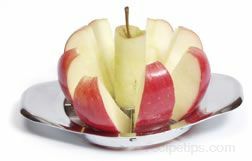 To make the apple rings, lay the apple on its side and cut slices to desired thickness. 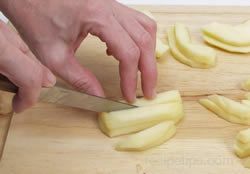 Using a sharp knife, cut the quarters into slices by placing the apple core side down and cutting into 1/8 to 1/4 inch slices. Thickness will depend on end use. If you want the apples to hold their shape, cut at least 1/4 inch thick. Cut across apple quarters for recipes with shorter cooking times. 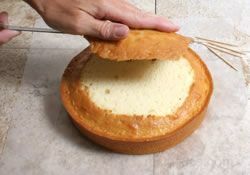 This will create a shorter slice that will cook faster. 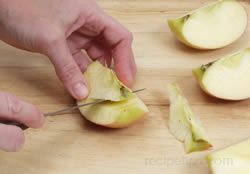 Cut apples into quarter sections and remove the core. Peel if desired. 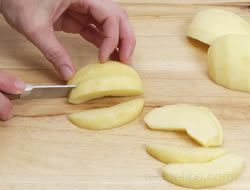 Wedges - To create apple wedges, cut quartered sections lengthwise into 2 or 3 sections, depending on desired thickness. 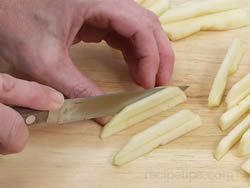 Wedges can also be cut with a tool called an apple wedger. 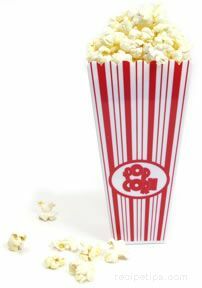 See Preparation Tools above. Triangles - Cut wedges as shown above. Stack wedges from one quarter on top of each other. Cut wedges crosswise to desired thickness to form triangles. 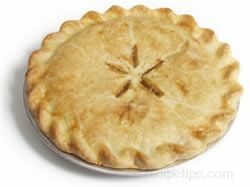 Place peeled and cored apple quarters with one flat side down. Cut the apple section lengthwise into 1/4 inch thick pieces. Turn the pieces so they are stacked on top of each other, parallel to the cutting surface and cut again into 1/4 inch sections. To Dice - Cut the 1/4 inch thick sections crosswise at 1/4 inch intervals to form 1/4 inch cubed pieces. 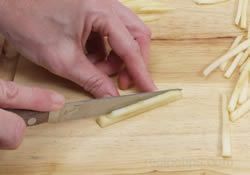 To Julienne - Instead of cutting the 1/4 inch sections crosswise, cut them in half lengthwise. 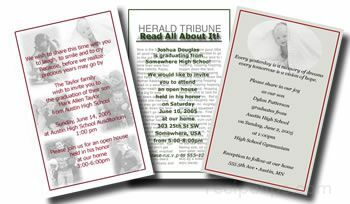 This will form 1/8 x 1/4 inch sections. Stack the two sections on top of each other with the 1/4 inch width parallel to the cutting surface. 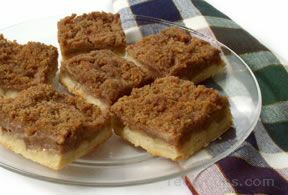 Cut in half again, lengthwise, to form 1/8 inch thick squared sticks. Note: When working with apples be sure to immerse in acidulated water to prevent them from turning brown. See Preventing Apples from Turning Brown for more information on how to prevent browning of apples.